A shiny new old bar! When weather permits and I have a free afternoon, I love walking over the Big Four Bridge and doing a mini pub crawl of sorts in Jeffersonville. There are currently a handful of bars and restaurants you can stop in at, including Big Four Burgers, Flat 12 Bierwerks, Red Yeti, Cluckers and Match (a bourbon and cigar bar). And soon, there will be a familiar face — O’Shea’s. Yesterday I met up with proprietor Tom O’Shea, who gave me the tour of the 119-year-old building they’ll be operating out of on Spring Street. Here’s a link to the story I wrote for Insider. O’Shea told me they’ll be calling it H.M. Frank’s: An O’Shea’s Public House in honor of the original tenant of the space who ran a dry goods store around 1897. Very cool history, and you can tell O’Shea and his team have put in many hours restoring the spot to its former glory. 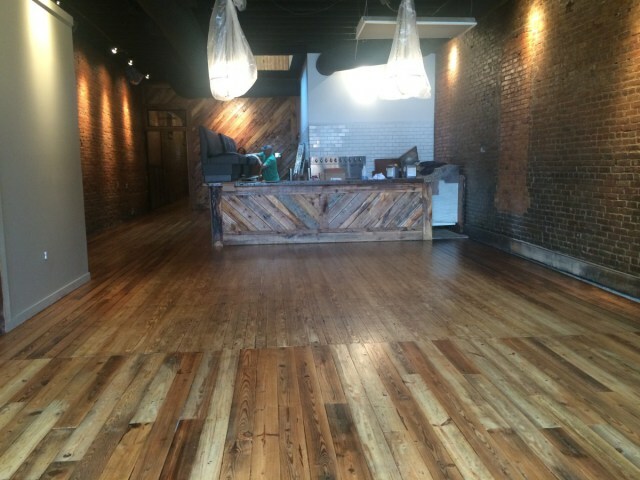 Exposed brick walls and shiny hardwood floors create a comfy, chill atmosphere. Expect about 14 beer taps, a full bar and counter service for food. He says it’ll hopefully be open April 1, and that’s no joke. Can’t wait!